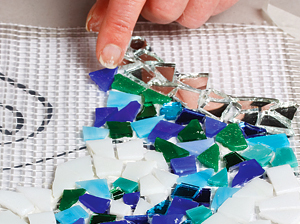 Direct Method Mosaics Advantages: Make large murals with a design that fits together like a jigsaw puzzle. 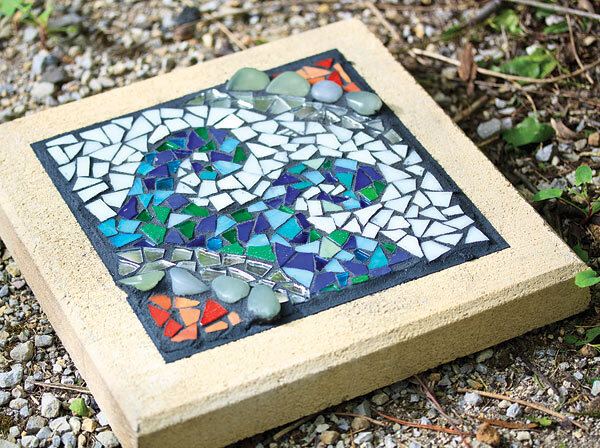 The project will be lighter in weight as individual pieces can be added (a large cement sheeting covered in mosaic can be very heavy). 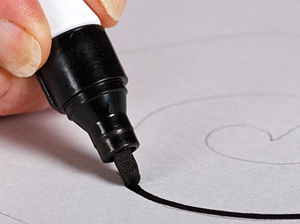 Draw your design on some paper. Place some Clear Plastic Sheeting over your design. Choose the tile selection and arrangement. 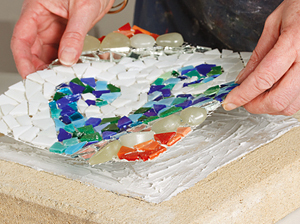 Place a sheet of Fibreglass Mesh over the drawing (large murals can be broken up by mosaicing individual parts). Using Tile Adhesive, butter the back of each tile and press into the mesh. Wipe off excess adhesive around and on the tile's face. Continue to cover your design, leaving a small clean and even gap between each tile. Leave the Mesh to dry for a few days. When dry, the tiled mesh can now be adhered directly onto the final surface (wall, concrete pavers, cement sheeting etc.). Put a layer of the Ceramic Tile Adhesive directly on to the surface to be covered. Lay the tiled mesh onto the wet adhesive. 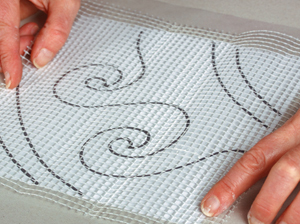 Using a damp cloth remove any excess tile adhesive which has oozed around the piece. Allow to dry for 24–48 hours depending on the weather. 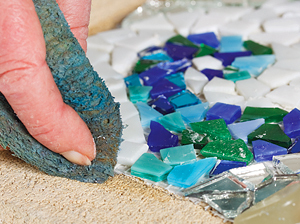 Mix grout to a creamy consistency and apply with a rag or rubber squeegee. 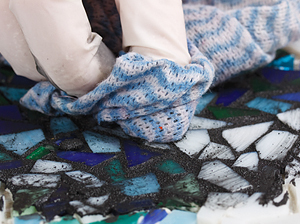 Use gloves to apply grout. Make sure that excess grout is removed quickly with a soft cloth as it will dry like concrete and will be difficult to remove when dry. Keep polishing the tiles with the cloth until all grout is removed and the tiles look very shiny. 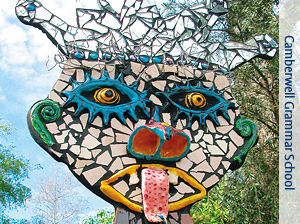 To make a sculpture, first create an armature out of chicken wire and stuff it with newspaper. Plastic containers, flower pots, polyballs can also be used as the base. 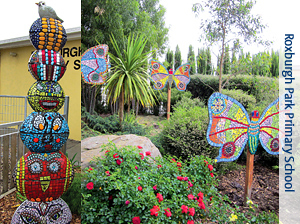 Chicken Wire provides the form with strength to hold the weight of the mosaics. 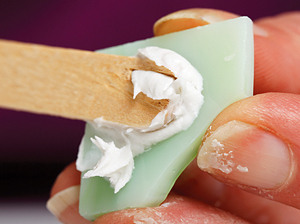 Cover the form in a layer of Zart Paper Mix (see page 250) then allow to dry. 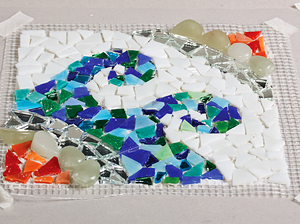 The tessarae (tiles) can now be applied and then grouted. 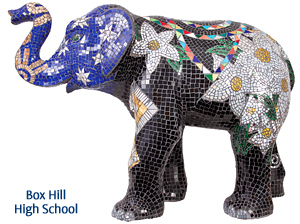 Explore and use a combination of tesserae material in your mosiac project. 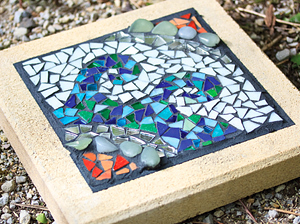 Tiles can be used alongside glazed and fired clay works, broken crockery, buttons or plastic objects. 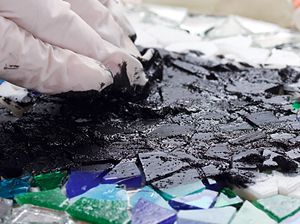 If creating an outdoor project, bear in mind plastic will deteriorate over time.